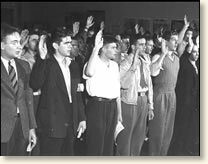 Millions volunteered or were drafted for military duty during World War II. The majority of these citizen-soldiers had no idea how to conduct themselves to prevent inadvertent disclosure of important information to the enemy. To remedy this, the government established rules of conduct. The following is excerpted from a document given to each soldier as he entered the battle area. THINK! Where does the enemy get his information -- information that can put you, and has put your comrades, adrift on an open sea: information that has lost battles and can lose more, unless you personally, vigilantly, perform your duty in SAFEGUARDING MILITARY INFORMATION? 1. Don't write military information of Army units -- their location, strength,, materiel, or equipment. 2. Don't write of military installations. 3. Don't write of transportation facilities. 4. Don't write of convoys, their routes, ports (including ports of embarkation and disembarkation), time en route, naval protection, or war incidents occurring en route. 5. Don't disclose movements of ships, naval or merchant, troops, or aircraft. 6. Don't mention plans and forecasts or orders for future operations, whether known or just your guess. 7. Don't write about the effect of enemy operations. 8. Don't tell of any casualty until released by proper authority (The Adjutant General) and then only by using the full name of the casualty. 9. Don't attempt to formulate or use a code system, cipher, or shorthand, or any other means to conceal the true meaning of your letter. Violations of this regulation will result in severe punishment. 10. Don't give your location in any way except as authorized by proper authority. Be sure nothing you write about discloses a more specific location than the one authorized. SILENCE MEANS SECURITY -- If violation of protective measures is serious within written communications it is disastrous in conversations. Protect your conversation as you do your letters, and be even more careful. A harmful letter can be nullified by censorship; loose talk is direct delivery to the enemy. Most enemy intelligence comes from prisoners. If captured, you are required to give only three facts: YOUR NAME, YOUR GRADE, YOUR ARMY SERIAL NUMBER. Don't talk, don't try to fake stories and use every effort to destroy all papers. When you are going into an area where capture is possible, carry only essential papers and plan to destroy them prior to capture if possible. Do not carry personal letters on your person; they tell much about you, and the envelope has on it your unit and organization. 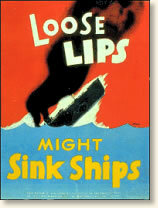 "Loose Lips Sink Ships," EyeWitness to History, www.eyewitnesstohistory.com (1997).